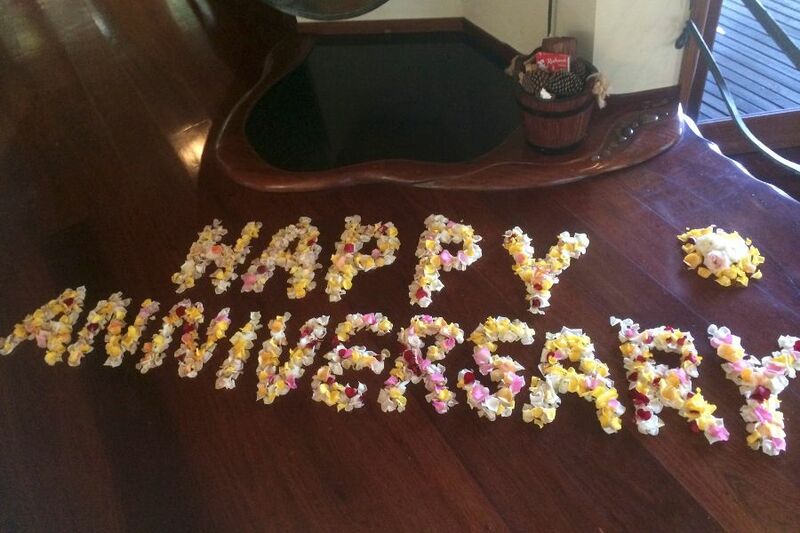 A guest popped in to the office to thank me yesterday… and this thankyou was a little different to the beautiful smiles on the faces of all our lovely guests as they drop their keys back in to reception and prepare to enter the reality of normal day to day. It was different because they hadn’t just spent a weekend or few nights getaway… they had just spent 7 days staying on one of our Luxury treehouses. This lovely couple told us that their annual holiday was normally booked abroad but they had become tired of wasting a few precious days of their break in travel time, and this year had decided to spend it closer to home so that they could really relax and enjoy their break. And… they were so impressed that they have already booked their annual holiday back with us next year! This kind of feedback really warms my heart, because as I am sitting here taking in the mist floating above the magnificent Lake Baroon and listening to the gentle sounds of wildlife scurrying and birds chirping on this crisp autumn morning, I can think of no place I would rather be. 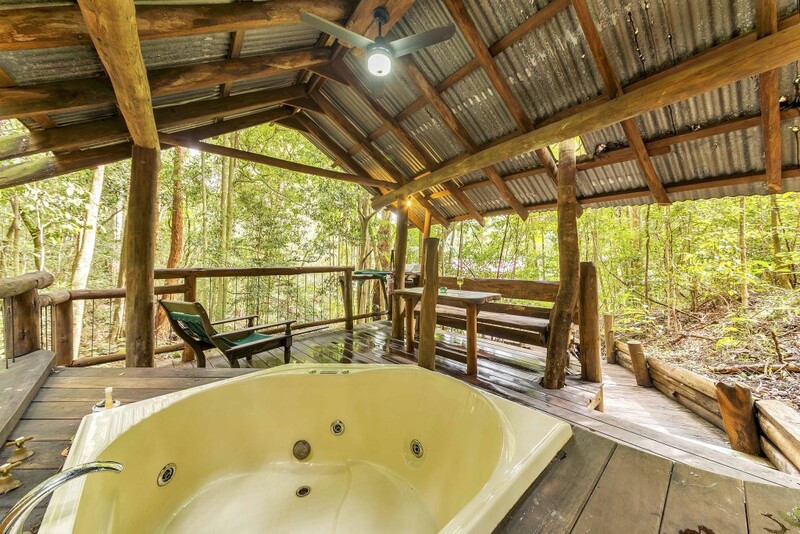 Whether you want to hideaway for a week with your loved one in the luxury of your world-class treehouse, sipping champagne to the warmth and crackle of your open fire… or if you want to explore the many national parks, including Kondalilla NP with its stunning waterfall and creeks, there really is something for everyone. Why not sample the taste sensations of our iconic Dining on the Deck lakeside restaurant or the many other top class restaurants in our region. You can browse the boutique shops, and tour the fantastic art trails of the hinterland. You can visit some of the top 10 beaches in the world only 30 mins away on the Sunshine Coast. In fact, you could explore for weeks and still be finding new things to do, experience and enjoy in our beautiful hinterland and Sunshine Coast region! Once more we are steadying ourselves for the Easter Break and preparing to welcome many holiday goers and diners through our oversized hand carved doors. Having been here a time or two before, we know things get busy over this long weekend in our lush hinterland hills. And with good reason! 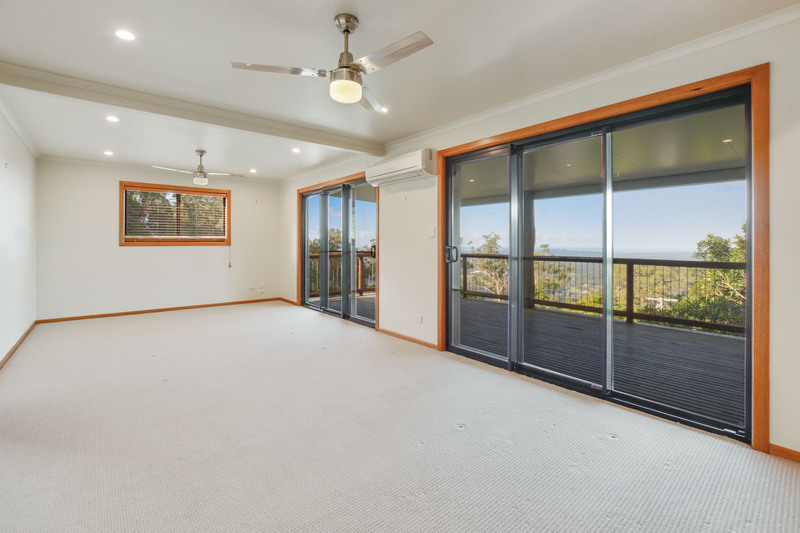 It’s a simply stunning time of year to soak up the Autumn sun, crisp clear mornings, and magnificent views of the Sunshine Coast, Lake Baroon, and the many national parks in our region. 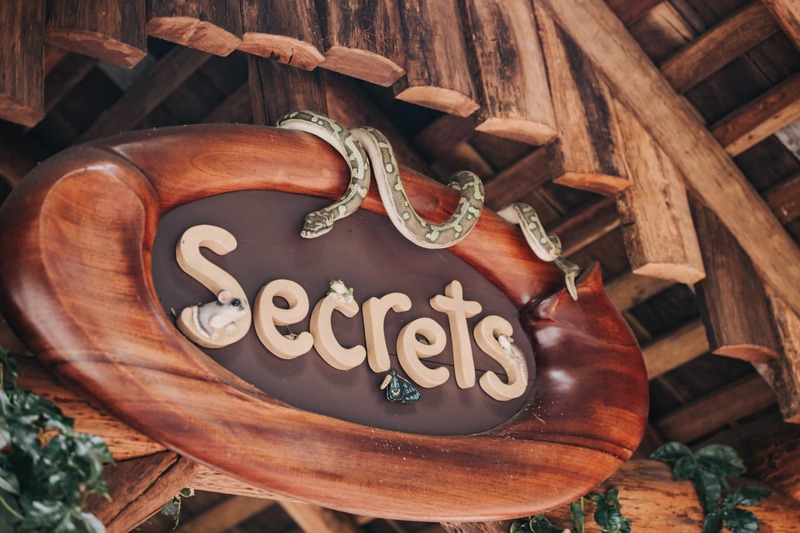 In true Secrets style, we are well prepared to give all our visitors the best experience possible. Our lovely staff are ready to greet expectant guests, the kitchen is stocked to the brim with fresh local produce and tasty ingredients, and our fabulous restaurant manager and her staff have their skates laced and ready to roll. It is a delightful time for George and I, as we get to meet up again with many long term guests and friends. So many opportunities for reminiscing, reconnecting, and rejoicing in each other’s company! 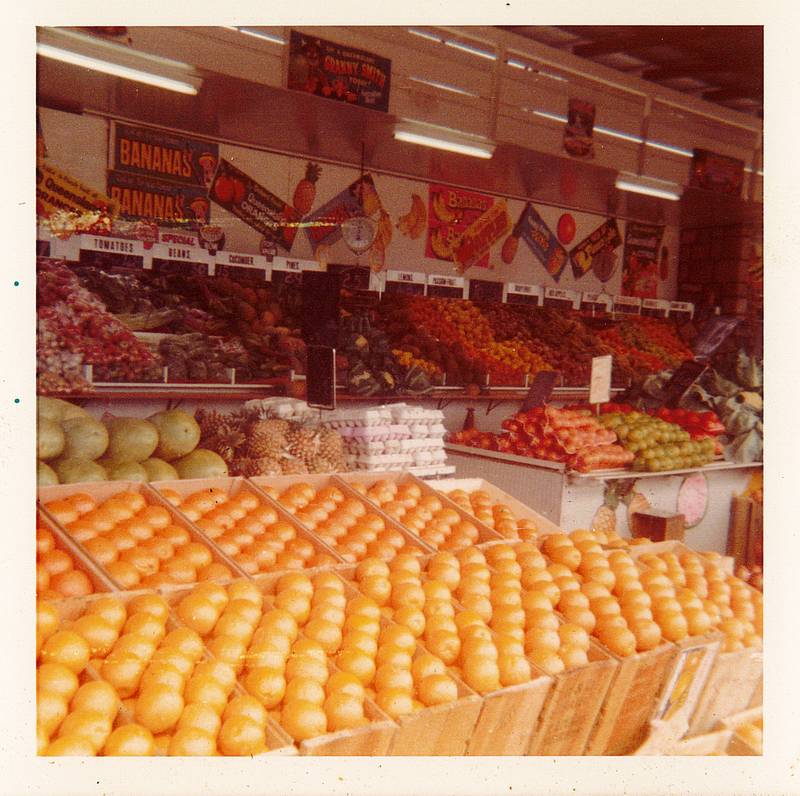 Many years ago now, George and I owned and ran a fruit shop business at Grantham, called Green Acres. 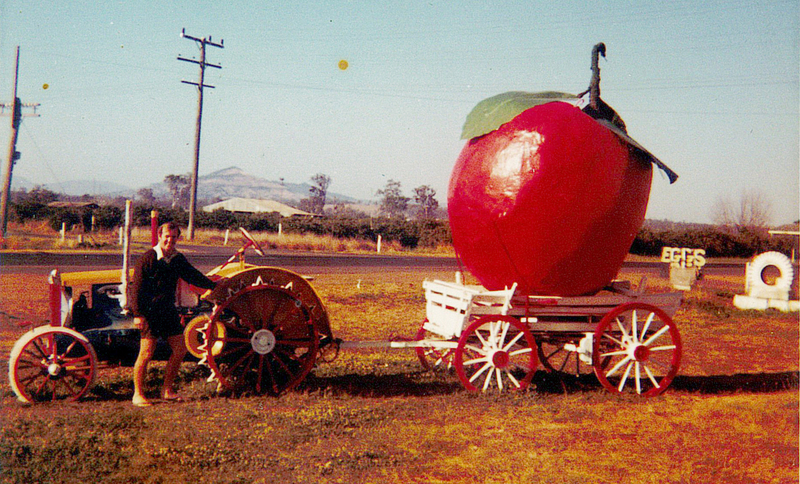 If you drove that way, you may still recall the tractor and dray out the front of our business with a large handmade orange sitting in it, and a huge watermelon hung up high in the air. 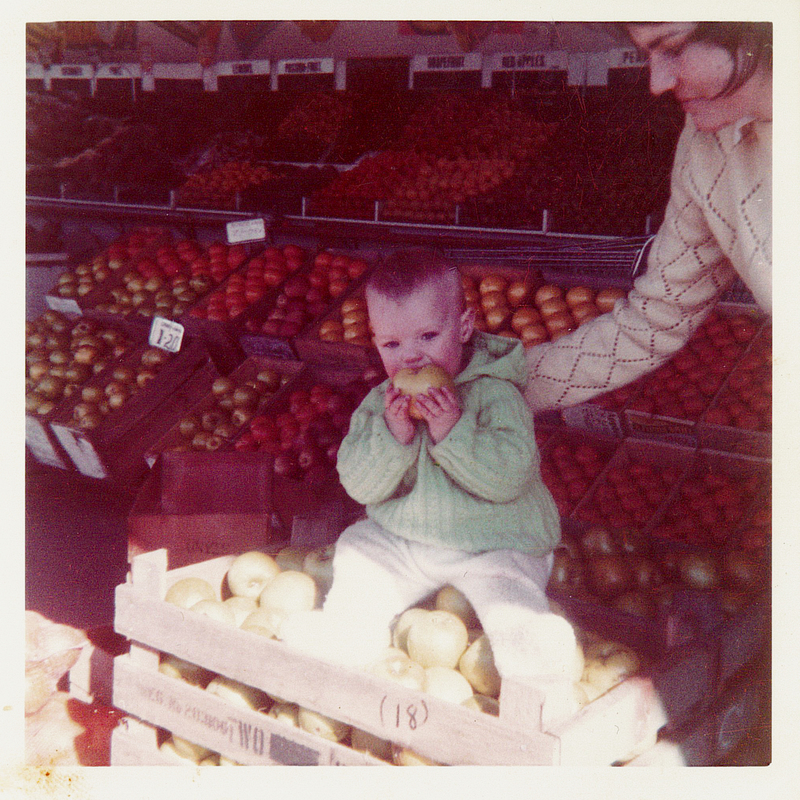 Our young daughter Cath would be perched on a stack of fruit as we did the needful and served our customers. At Easter, we used to watch the traffic going buy all weekend while we worked, wondering what it would be like to be off to the coast for a weekend! 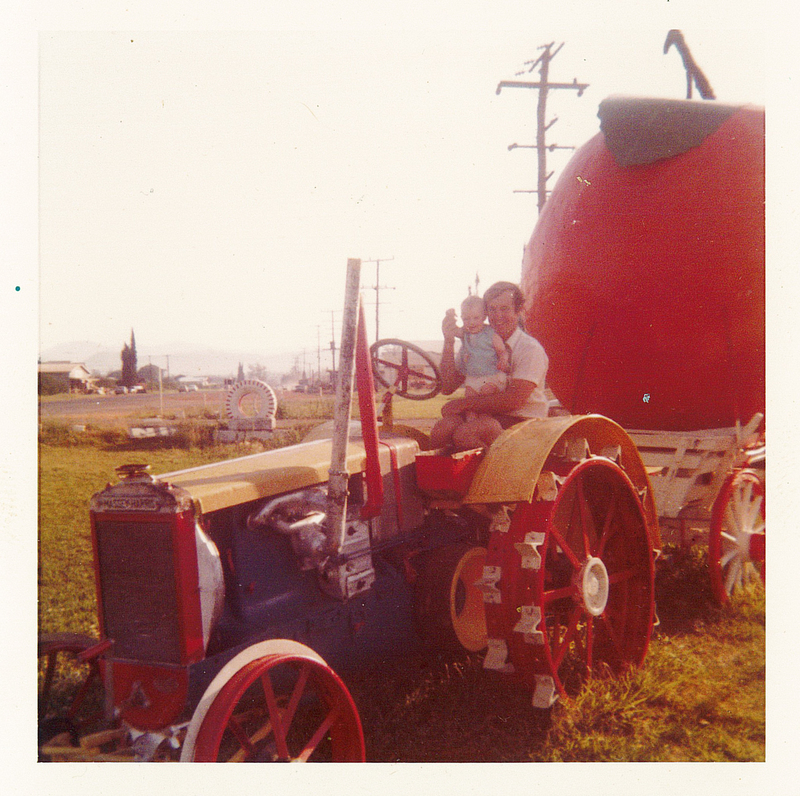 Well, here we are nearly 50 years later, and we are still doing it… and now Cath is perched in front of a computer doing our marketing! But… Easter means so much more than a beach holiday for many of us. It is not just a time for BBQ’s and sunhats and your favourite stubbie holder… though all of that is lovely! For Christians it is about selflessness, sacrifice and forgiveness. It is about showing respect, making wise and considered choices, and about realising that no one is perfect, but that Christ gives us Salvation if we ask for it. For me this means that there is nothing we do that is ever so bad that we cannot be forgiven, and that we should learn to forgive others and ourselves. It is not our place to judge other’s choices or actions, but to strive to be the best version of ourselves that we can be. So out of respect, on Easter Friday and Easter Monday we have always closed our doors to our beautiful Dining on the Deck daytime licenced restaurant. We are open Easter Saturday and Sunday. It is our wish that everyone enjoys their well-earned break this Easter, and whether it’s a BBQ at the beach or a gathering on our beautiful deck for a meal with family and friends, please remember to show respect and kindness to those who have to work to provide those services to ensure your happy holiday. We would like to show our own respect to our very special staff… our fantastic housekeepers, front of house, kitchen and restaurant staff. All of whom work their little hearts out with consummate professionalism, infectious smiles and a genuine desire to provide our quests with the best experience possible. Above all, please drive with care and respect as we would like to catch up with you all again next year! Happy Easter from George and Aldy! 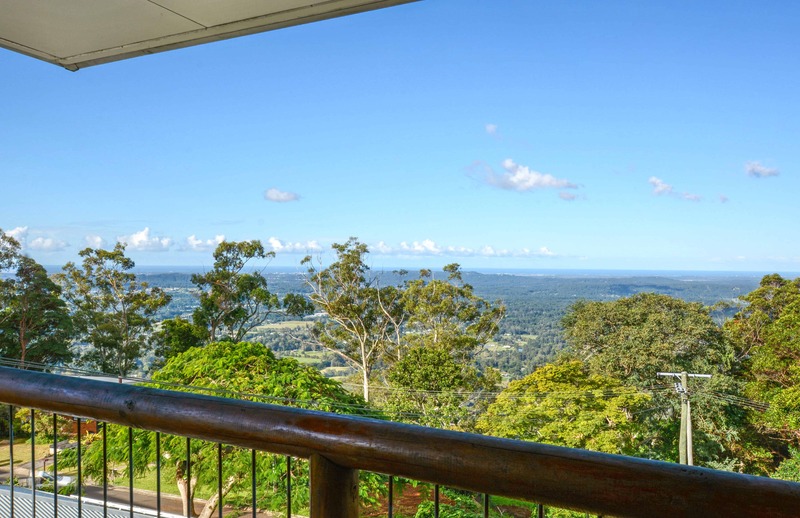 If you live in the Sunshine coast Hinterland then odds are that you are quite used to excited day-trippers slowing their cars down with faces pressed against the glass, as their passengers enjoy our rolling hills and sweeping rainforest and ocean views. There has been a bit more of that than normal this last week along Montville’s Western Avenue, with the latest Endeavour Prize home opening its beautiful white doors to the long awaiting public. If you are one of the many people wanting to check out this beautiful home and support this worthy cause, then turn off the Montville Maleny Road onto Western Avenue, and it is a couple of kilometres along on the right… and just a jump away from our iconic rainforest restaurant Dining on the Deck at Secrets on the Lake. We have noticed that many of you are making the choice to then continue on just a hop along Western Avenue, take the left turn down Narrows Road, and end up walking through the beautiful hand-carved wooden doors of our Dining on the Deck daytime licensed restaurant. Why not make a real day of it and check out Dining on the Deck, winner of the AGFG People’s Choice Award 2019? 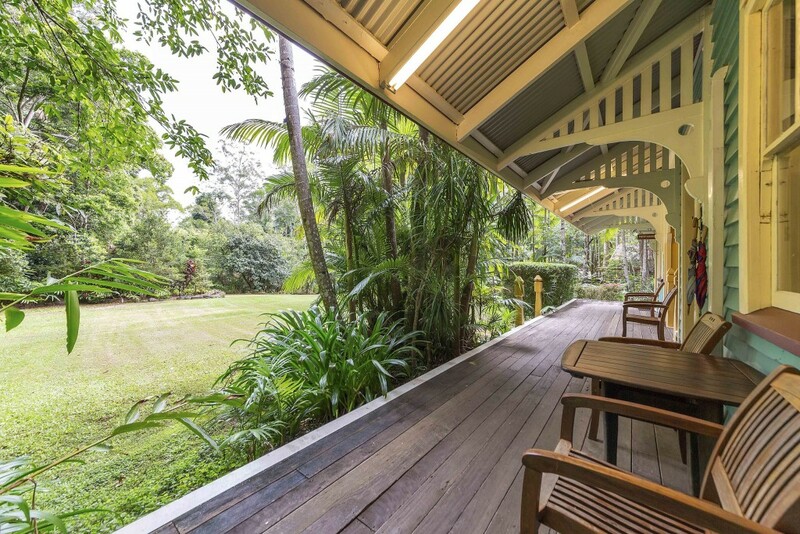 Not only are we only 3 minutes drive from your new prize home, but our rainforest restaurant is perched on the shores of magnificent Lake Baroon and has arguably one of the best lake views the hinterland has on offer. It’s a perfect pitstop for a beautiful breakfast, mouth-watering lunch, or afternoon tea with a cheese platter and cold glass of your fancy, or a warm mug with one of our famous high teas. Bookings for breakfast taken before 9:30 can also take advantage of our Earlybird Special and get a free cup of standard tea or coffee with any Secrets Benedict, Secrets Hunter, Secrets Gatherer, or Secrets Omelette. We also offer a wide variety of Gluten Free, Paleo and Vegetarian choices! Best of luck in the prize home draw! If you win, then we look forward to serving you and your guests in our restaurant when you need a break from that amazing kitchen. But if you miss out, then there is always the chance to book an escape in one of our truly unique world-class luxury treehouses to console you. 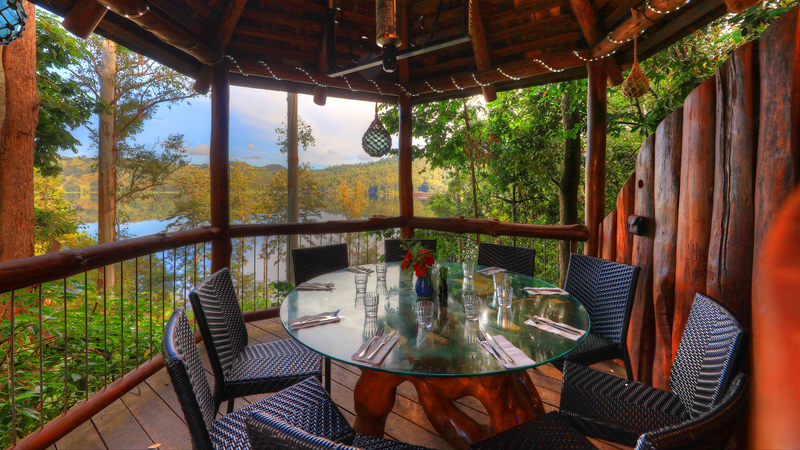 Ask about availability for a treehouse tour when you have a meal at Dining on the Deck. RACQ just voted the Hinterland drive the 2nd best road trip in Queensland. It was only bested by the Pacific Coast way, which ironically the Hinterland drive is also a prominent part of! Though it is always fantastic to see our beautiful region get its due accolades… this news comes as no surprise to those of us already living, dining or holidaying in the Hinterland! This place really does have it all… and there is something here for you whatever your unique interest may be. Check out the stunning national heritage listed Glasshouse Mountains. Their unique exposed sub-volcanic landforms and remarkable aesthetic attraction has become dreamtime legend over 60,000 years and is one of the biggest tourist attractions of our region. National parks abound throughout the whole of the hinterland. Take your pick or try them all out over time! Set out through the pristine temperate rainforest of the different trails comprising the Great Walks or simply find your perfect spot and relax by the babble of our beautiful mountain creeks and waterfalls. With each step up the range, the lush green paddocks become a little bit greener… and becomes a little cooler than the famous beach towns right at the bottom of our hill. 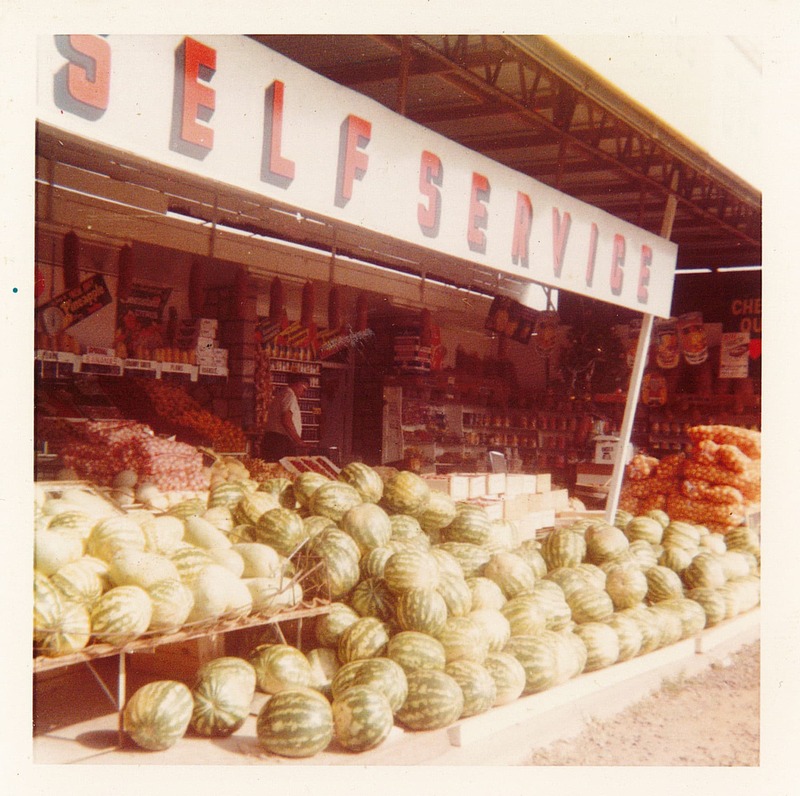 And when you arrive at the iconic tourist town Montville, you can take a pitstop and cruise the many boutique shops, galleries and crafts our region has become famous for. 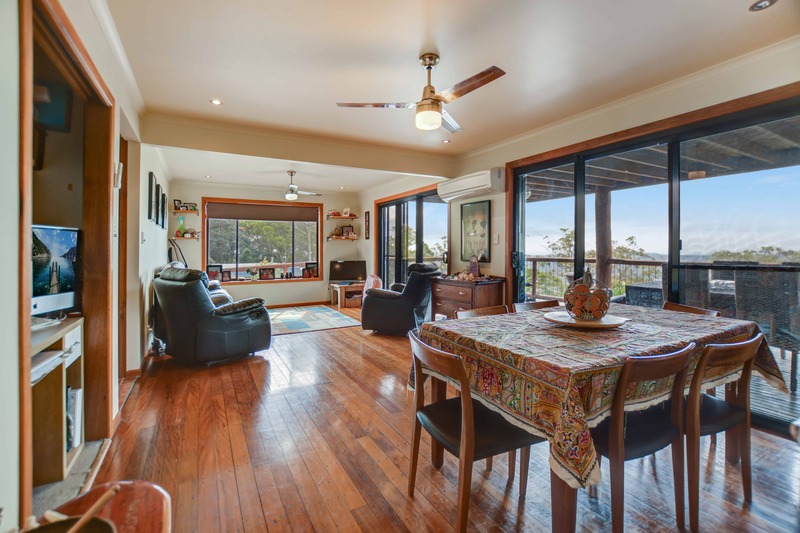 Lake Baroon provides us with stunning lake views and recreational activities… and the range section of the Hinterland Drive gifts the day-tripper with a multitude of magnificent views of the lake, and of the ocean and sunshine coast beaches beyond on the eastern side of the range. No two days provide the same view… and every day gives a unique slant on the natural beauty of the Hinterland. 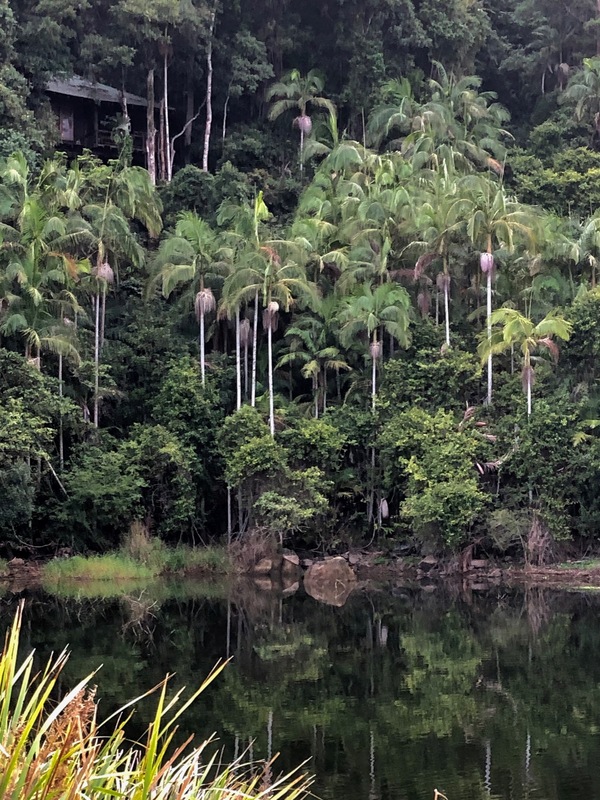 And the best part about Queensland’s best driving route is something that combines all of the blessings of the Hinterland in one location… a visit to Secrets on the Lake! 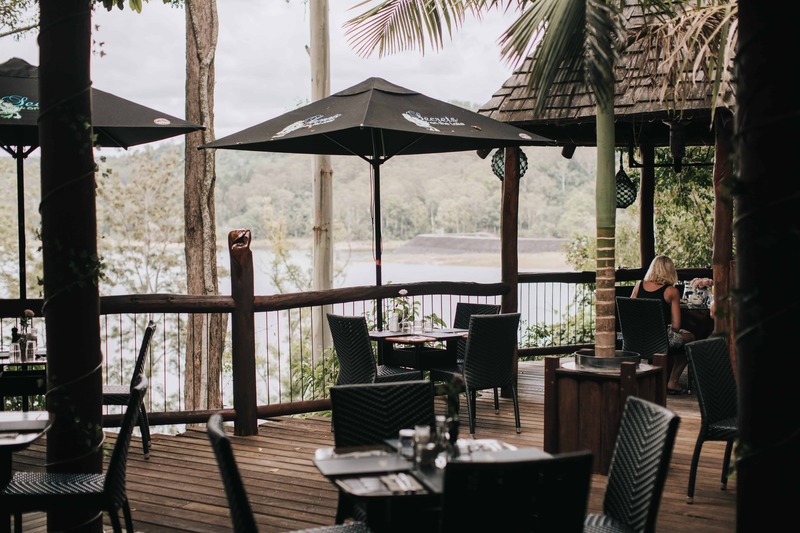 Drop in for a meal at our iconic rainforest restaurant Dining on the Deck, with arguably one of the best lakeside locations and views our region has to offer. 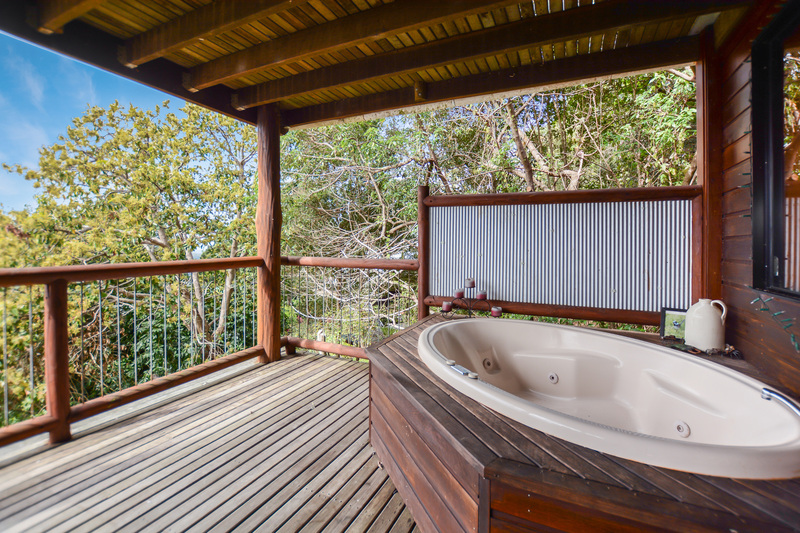 Spend some time to really enjoy the sights, sounds and experiences of the Hinterland and book to stay in one of our world-class luxury treehouses featured on National TV as ’the perfect romantic escape for couples’. 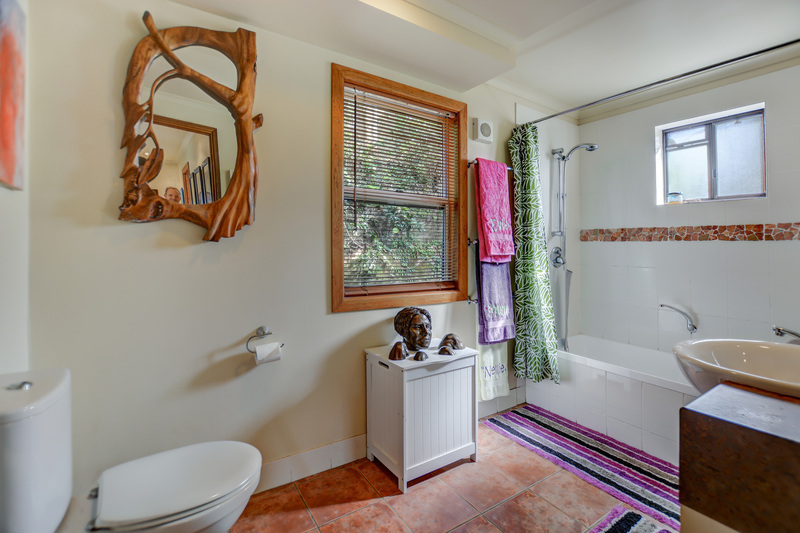 Our treehouses are nestled in the rainforest canopy right on the shores of magnificent Lake Baroon. Thank you for your review Damien! It is a lovely reminder about how the unique qualities of our charming WhistleStop Cabin touch the souls of all those who stay there. We spend so much of our time focused on telling you about our iconic Dining on the Deck restaurant, the stunning Secrets Wedding Venues, and our world-class luxury hand carved treehouses, that it is easy to neglect mention of our beautiful WhistleStop cabin tucked away privately in pristine rainforest. 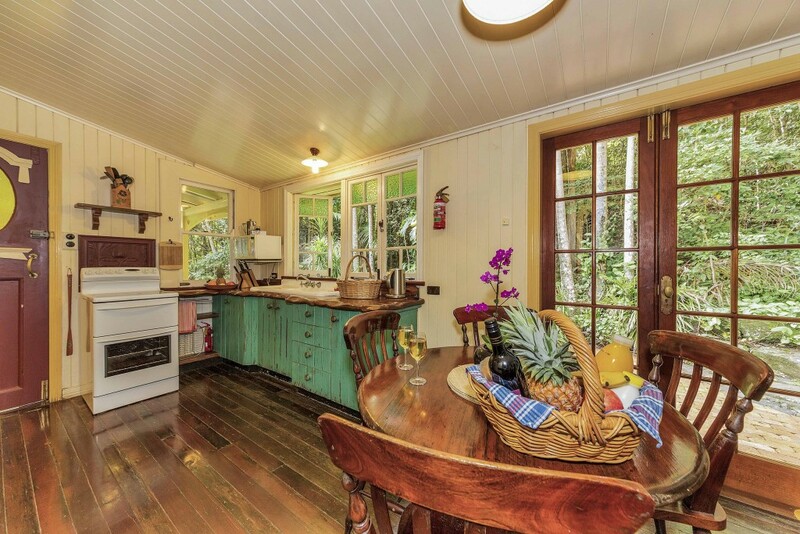 With all the charm of yesteryear and all the luxuries of modern living, including the brand new recently refurbished kitchen… this charming 2 bedroom converted railway station is a nostalgic favourite of many Secrets on the Lake guests. Our guests book to stay in the WhistleStop for many reasons. 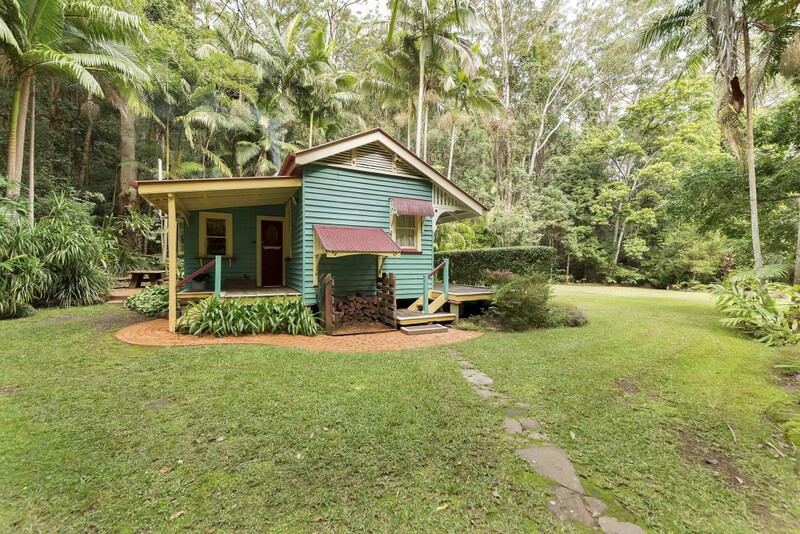 Some purely because it is an old Queenslander railway station and has enjoyed many incarnations in its long colourful history since first built in Beerburrum in 1910. It will have its 110th birthday next year… stay tuned for the birthday celebrations! 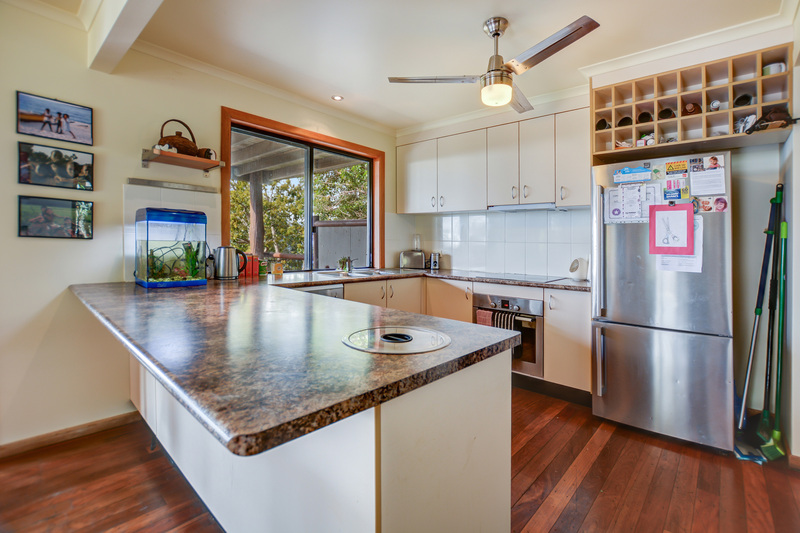 Other’s come because it’s the perfect family cabin to do some outdoor exploring of the many bushwalking trails, national parks, creeks and waterfalls nearby… literally just metres from its doorstep. Some guests don’t realize that when we have a lot of rain you can sit in the spa right beside rapids cascading… so close you can feel their spray on your face. Our WhistleStop guests often come back, and back, and back again… because your privacy is guaranteed when you walk to your cabin across your private hand-built bridge over the permanently running stream. The bridge is another one of our talented son Rob’s very special carved creations! But when you stay at the WhistleStop your backyard is much larger than its own private grounds… you have access to all the facilities and features of the iconic Secrets on the Lake when you are ready to face the world again! Your playground just gets bigger and bigger. You can wander the Secrets Gardens, use our canoes, fish, play billiards, access our DVD and entertainment libraries, and the list goes on…. Kind regards George and Aldy! And nothing happened! Well, not entirely nothing… the surf was definitely something to write home about, and we got some lovely showers to refresh the lush gardens here at Secrets on the Lake. We know that some areas certainly felt Oma’s onslaught and our hearts go out to those in North Queensland who are currently battening down again while still recovering from recently receiving a year’s worth of rain in just one week! Here in the Sunshine Coast Hinterland we are blessed when it comes to weather events. In the heat of the QLD summer we are always a welcome few degrees cooler than the coastal towns only half an hour away down the hill. 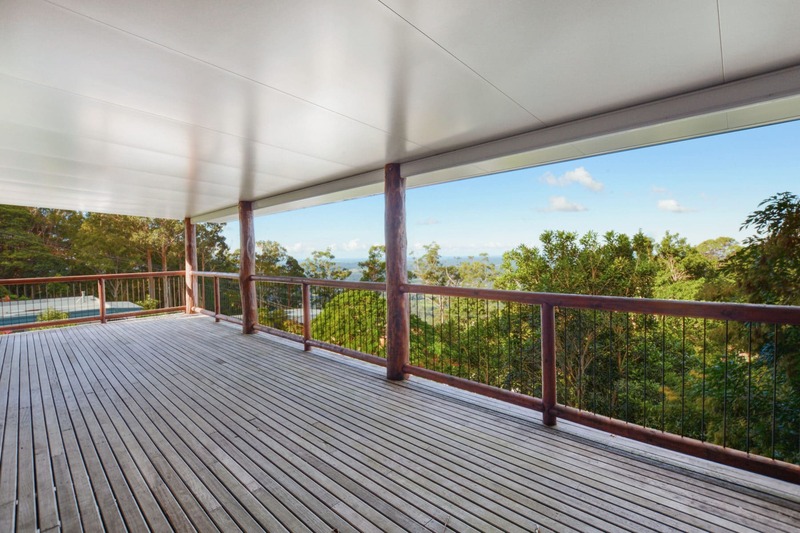 The cool coastal breezes waft up the hill, thermal through our valleys and travel across the rippling water’s of magnificent Lake Baroon right in front of your treehouse decks. When it buckets with rain, all of our many beautiful creeks and waterways start pumping, and the private waterfall behind our penthouse treehouse ‘Secrets’ thunders its own powerful rhythmic force. The creek behind the rustic spa and BBQ house at our WhistleStop cabin becomes a rushing rapids that you can almost reach out and touch. And the Lake Baroon spillway can send shoots of water through the air in a glorious display of nature’s raw power… much to the delight of tourists and locals alike who flock to its viewing platform for the perfect picture. 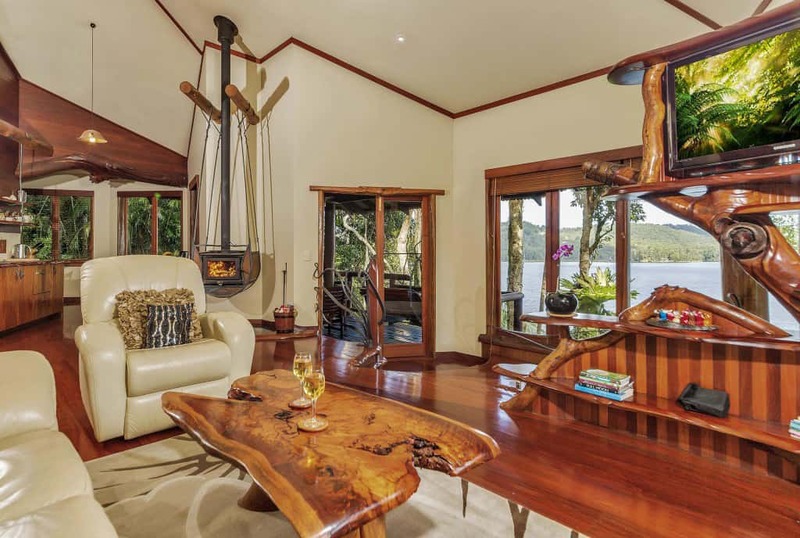 The cooler winter months are our peak accommodation times, largely because our guests really enjoy the warmth of our stunning floating fireplaces as they re-energize, reconnect with each other, and enjoy our pristine rainforest environment. The beauty of the Sunshine Coast’s temperate climate means that it just doesn’t ever really get cold enough for a log fire in the popular tourist destinations down on the coastal flats. Choosing the Hinterland as your holiday or restaurant destination actually gives you the welcome chance to really enjoy the hotter and cooler months for all their glory. So, before you buy into the latest ‘most sophisticated’ weather predictions and cancel your holiday or Hinterland dining plans we hope you check in with us to see what is happening outside of the algorythmns. Rain, hail, snow or shine… Secrets on the Lake has you covered, and each season gives you a different glimpse into the stunning location we are lucky enough to call home. As a parent it is an amazing and sometimes nail-biting journey watching your child take their first steps… on the loungeroom floor, in the schoolground, in their career, and in their relationships. As you watch your children walk out the front door into this big wide world, confidently taking steps towards their dreams and life’s journey, it is a special moment of pride, joy and dare I say… a tinge of sadness. It’s a fine line traveled between shouting hallelujah at their successes and then holding yourself back when they stumble along the way to allow them to build the resilience to stand tall and on their own two feet. But wherever possible you offer words of comfort and unconditional love… they will always be your babies. And wherever possible you do what you can to help ease their journey. And then, when your nest is once again empty. What do you do?! Where do you go from here? This is your time and sometimes you need reminding who you have become, and of the things that give you joy and happiness. Seize this time! Grab the moments of joy and reconnect with each other as a couple… not just as Mum and Dad! George and I believe that one of the best ways to do this is to regularly find time for a little escape far from the madding crowd… to celebrate each other and your relationship, to rekindle the fires, and to reinforce your connection. This is one of the reasons we built our treehouse retreat in the hinterland hills over 20 years ago. Secrets is a special place lovingly designed to celebrate romance, connection and creativity. When you come to Secrets, you are welcomed into our family… you are not just given a key and shown your cabin. There is a reason we have been billed on national television as ‘the perfect romantic escape for couples’. After 50 years of marriage, George and I know a thing or two about romance and we have poured all that we have learned into creating our magical wonderland. We invite you to come and visit… whether for a romantic meal at our Dining on the Deck daytime licenced restaurant, with arguably one of the best lakeside views in the hinterland… or to spend time together in one of our stunning hand-crafted luxury treehouses. Because if you’re lucky… this time belonging to just you is fleeting… the blessing is that you might be lucky enough to get to start all over again with your grandchildren! Secrets is a very special place… George and I think it is one of the most magical places in the world! 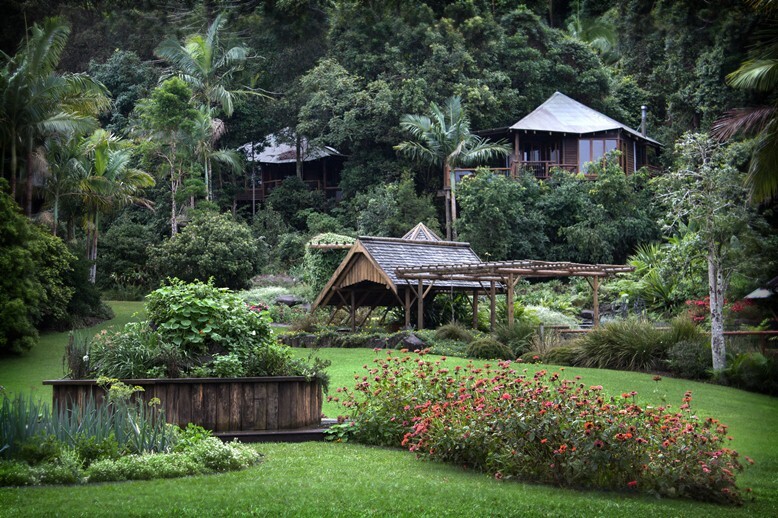 Our treehouse guests and Dining on the Deck visitors let us know on a daily basis that the peace, creativity and connection to nature that is the cornerstone of Secrets touches the hearts and souls of all who visit our rainforest wonderland. Often George and I are busy serving guests, maintaining our beautiful treehouses and manicuring our lush gardens. We don’t often get the chance to sit and smell the roses. In the quiet times like early this morning when I woke to the beautiful bird song that pulled me from my sleep, I feel immersed in its peacefulness and renewed by the calm and spiritual energy that has made this place a gathering spot for the Aboriginal tribes for many thousands of years. 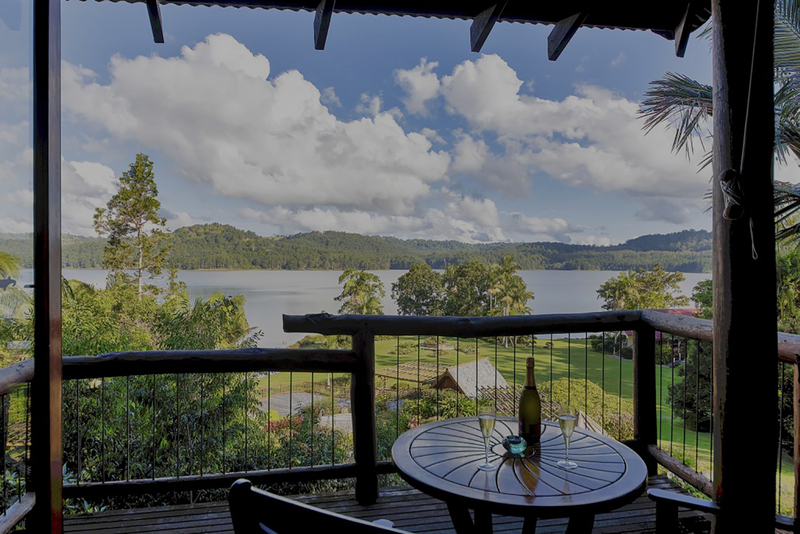 We can grab a moment and allow ourselves to get lost in the wonderful views of magnificent Lake Baroon and the cool of the pristine temperate rainforest. And then there are also the many lovely things that we have brought about in the building of our dream… such as our amazing gardens, and the unique and truly delightful treehouses where our passion and creativity was allowed full steam. Yes… we are not biased to think this is one of the most magical places in the world, and we love and are very proud to be here. However, even being lucky enough to live and work in paradise, we too need to have a holiday from time to time. The most recent plan to find a bolt hole for 2 weeks in February this year fell under a bus, when some key staff dropped the bombshell that they were leaving, just before we were due to head off. Damn there goes the cruise ship without us. If you are like us and can only grab a few days here and there amongst work and staff commitments… we understand you entirely. We are often time poor… but even grabbing a few days escape is enough to recharge the batteries and reconnect busy relationships. Secrets is the perfect place to do just this, and for people who live in South East Queensland you won’t need to spend days travelling to reach paradise. Why Secrets? Because it ticks all the boxes. Peace, tranquillity, escape, beauty, excitement, exercise, things to do or not to do if you so choose. For some of you, it’s also a chance to revisit and catch up with George and myself, enjoy great, healthy, homemade food and taste treats from our Dining on the Deck daytime restaurant or delivered to your treehouse door. You might also like to venture out to sample the delights of the restaurant culture that the hinterland has become famous for. The delightful part about it is that for Sunshine Coasters, although it is just a hop and a step away, it’s also a world away. Take a moment… smell the roses. We will see you soon! Planning a visit to Secrets on the Lake is an exciting and romantic thing to do for your partner. The feeling of love and connection that comes from being totally surprised by a partner who has gone to a lot of trouble is one of the glues that keep a relationship thriving. Some of our guests can be masters of subterfuge in order to hide the trail leading to this big surprise. My team love to get involved and the fun and games not only make our job a real pleasure but makes the event unforgettable. I recall way back a lovely lady asking us if we would let her visit Possums treehouse to show her husband how beautiful it was. Of course we said yes… because she had already secretly paid for the room! Off they went to Possums, and the story goes that as she was showing him the treehouse, she decided to take the framed picture of Bower Birds off the wall and put up another painting (his birthday present) and then proceeded to sit on the lounge and then lie on the bed to try it out! Obviously, he became more and more shocked by her behaviour until he finally got it. They were actually staying! Their smiles on returning to the reception were priceless. We’ve had another lovely gentleman arrive with his beloved who had had a tea towel wrapped around her head since they left home. She was left in the car while he checked in, and then lead down the boardwalk to the treehouse and unmasked at the entrance to a wonderful surprise of a treehouse filled with rose petals, romantic music and luxury chocolates. 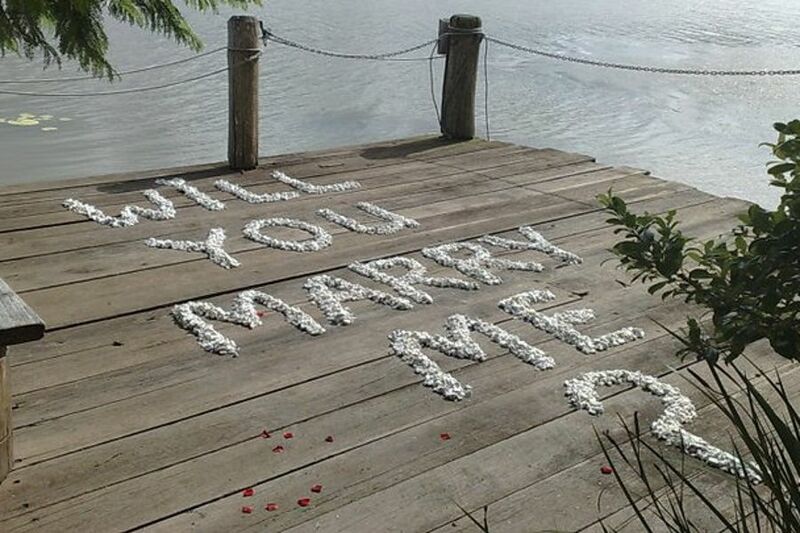 Elopements are another opportunity to surprise, with ring boxes hidden in petal hearts on the bed, white pebbles spelling out “Will you marry me?” set up on the jetty, and everything in between… depending on possibility and imagination. All of this brings joy and harmony between couples and is so worth the trouble, whether it be the one doing the planning or the one trying not to let them know they have sussed that something is going on. God Bless them! Why not let our team at Secrets help you to celebrate in a way that becomes a story at the dinner table that gets regaled for the rest of your life. If you have a hankering for a surprise to spoil your better half, then give our friendly team a call for some ideas or suggestions on how we can make your own surprises come to fruition. Call us on (07)54785888 or checkout our website www.secretsonthelake.com.au and send us an enquiry. Over the years we have realized that awards in the hospitality industry are often based on who you know rather than what you know. A panel of ‘experts’ sit and dissect your entry form which is either rejected for using a confusingly incorrect category system, or is disregarded for not using the special phraseology that particular awards committee require, or overlooked because you are a newcomer and need to serve your time. In 90% of cases big companies spend big money paying for a professional awards writer who then puts together a submission… and then maybe you are in with a chance??! We decided many years ago to stop playing that game. We just don’t enter awards anymore. The joy on the faces of our luxury treehouse guests, return customers, wedding couples and restaurant patrons lets us know how our business is doing. The return customers, soul smiles and excellent reviews are really all the award we need. 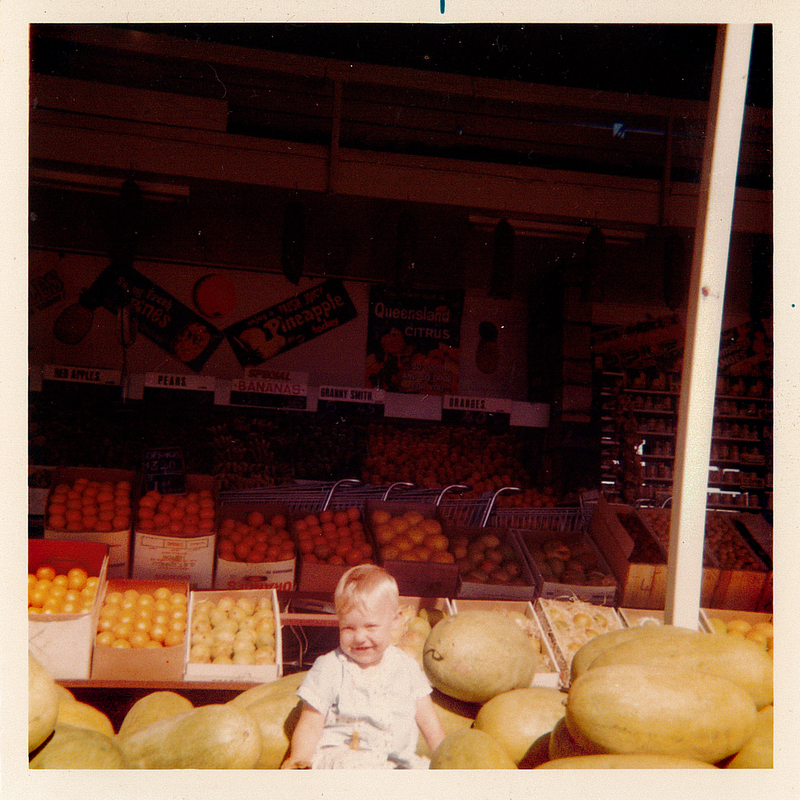 And I guess that’s why our news this week is extra special for us… because it comes from you! 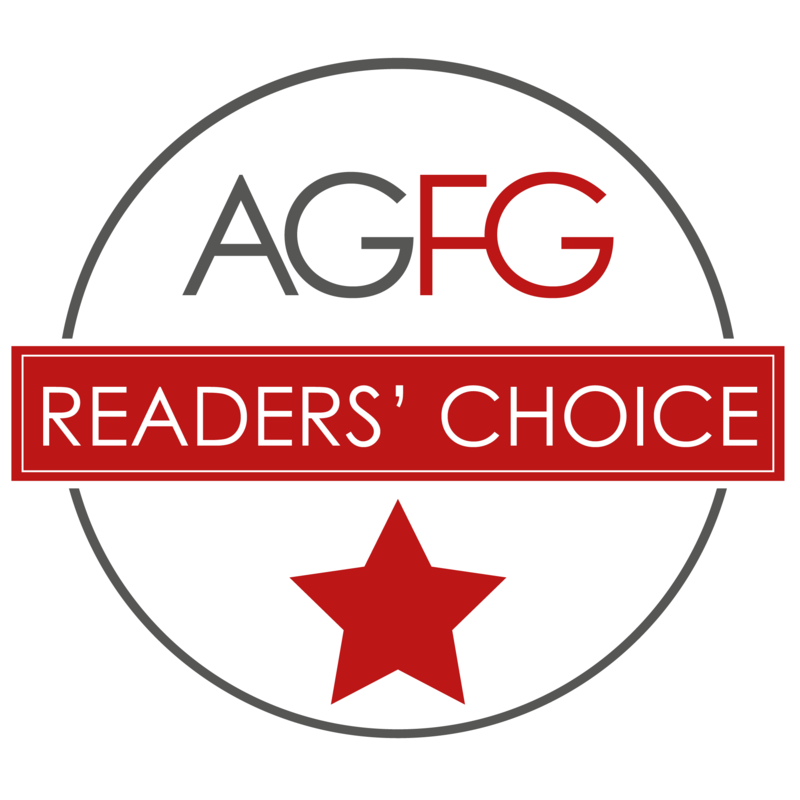 What makes this different is that the annual AGFG Readers’ Choice Awards are designed to give the Australian public the opportunity to vote for their favourite establishments throughout the year. Patrons recognize a business’s efforts and ethics and then vote. To have received the 2019 People Choice Award we received the most votes in 2018 in our region and for our respective category. For us this means an awful lot! 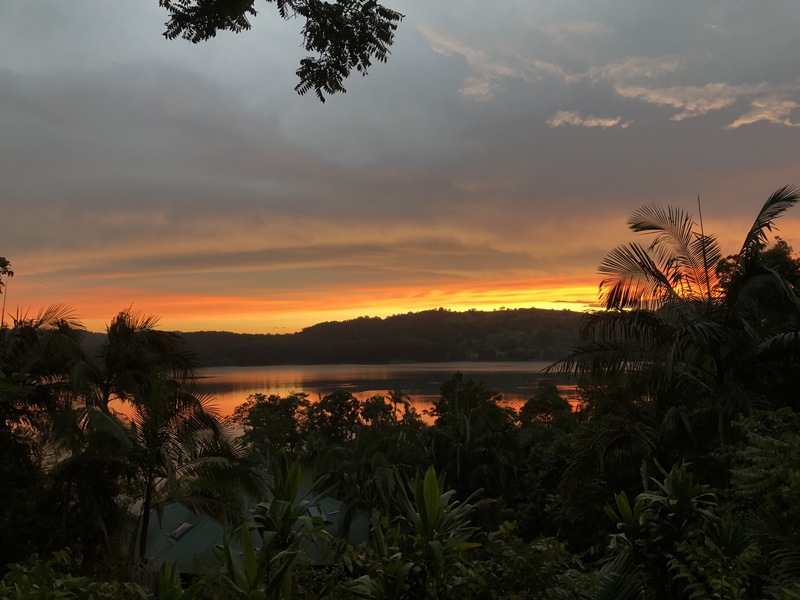 We are constantly trying to improve our facilities, service, products and food… and we are dedicated to providing you amazing service and healthy local food in a magnificent setting right on the shores of beautiful Lake Baroon. It does our hearts good to see that our efforts and ethics have been acknowledged. We must be on the right track?? And we will keep on doing what we do to the best of our ability.